There’s a sort of pretension that comes with early success. It makes me kinda stabby. Many of these artist don’t offer much in the way of exercises because they haven’t really worked out a working practice for themselves. And there is something so disingenuous when offering exercises for creative blocks but hastily claiming you’ve never experienced it yourself. Anyway, some nice pictures of very current (read: not enduring) illustration art. There are a couple of artists in there that do seem admirable and I was glad to briefly meet them in the pages. Save your money and get it from the library. I fully expected to love this book. I've been reading (and loving) The Jealous Curator for many years and Danielle has featured a bunch of these artists on her site. What I didn't expect was to read this book, cover to cover, in sequential order, in a matter of days. I thought I'd leave it there on the coffee table and just sort of pick it up and peruse through it occasionally, when I felt like looking at pretty pictures, being inspired, or, yes, when I needed a bit of unblocking. Instead I opened it to page one on the day it hit my doorstep and that was that. I took it to bed with me at night. I stuffed it in my bag when I went out. 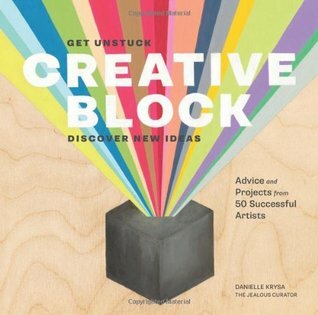 I couldn't stop greedily reading about artist after brilliant artist (I am *this* close to challenging myself to try every single "Creative Unblock" project in the book). This is such a lovely, inspirational read, so tightly packed with useful advice and project ideas. I'll be going back to this one for years. Interesting Interesting to see different artists and their struggles and successes in art. It would be cool if at the end the projects were listed. Fantastic to see and read how other people help themselves find their ideas when it's a struggle. Beautiful to look at and easy to read. A keeper for your library. I enjoyed the artist interviews, even though I wished they were longer and more varied. The ideas to overcome a creative block are hugely varied and inspiring! There is a really wide assortment of artists featured in this book (just like the website it was inspired by), so only the rare person is going to resonate with ALL the artists, but it is a really cool coffee table book that also offers a lot of inspiration, motivation and down-to-earth, easy to do "creative unblocking" exercises. Be sure to have your laptop at the ready while reading, because every other page had artists, books and ideas I wanted to look up and learn more about. Rarely does the "book from blog" genre succeed and this one really did a great job. My ONLY complaint, is that the majority of artists featured in this book claimed to not be bothered by their inner critic, and therefore rarely had creative blocks. I find this incredibly hard to believe, not to mention that it made for a jarring overall experience of reading the book, SINCE THAT'S WHAT THE BOOK IS SUPPOSED TO BE ABOUT. But if you can move past that, and just enjoy the great images, quirky and thoughtful "creative unblocking exercises," and wonderfully diverse selection of art mediums, it's a nice read. I recently went through a three month creative block in which I didn't hand embroider a single thing. Since I have a small business creating hand embroidery, this isn't a good thing to have happen! What I gleaned from this book is that I'm not alone. It happens to all of us at one time or another.I will often think that I'm not good enough, who am I fooling> I'm not an artist! I can't do this, or this, or that, so I must be a fraud, and I should just give up. My embroidery hero, Jenny Hart, is interviewed in this book, and I was shocked (and heartened (is that bad?!? )), to learn that she sometimes feels the same way! I think Jenny is an amazing artist, and love her artwork. But she sometimes feels like she's a fraud, too. If someone I hold in such high regard feels this way, then maybe, just maybe, it's a "normal" feeling, and I really am an artist. I recently discovered Danielle Krysa's blog The Jealous Curator and really appreciate the artists she features.Creative Block doesn't break any new ground as far as the concept goes, there are other books that use a similar format of selecting a group of artists, asking them each a similar set of interview questions, and featuring their answers along with some samples of their work.What sets Creative Block apart are its beautiful design, the selection of the 50 featured artist and the great unblocking exercises. The book is well worth your time if just for the survey of the contemporary artist showcased - but you'll likely come away with more than just dazzled eyes. This is a fun one -- featuring the work and working lives of 50 current, trendy artists. I cannot pretend to be a fancy lady here. I don't have a lot of background with fine art. But I'm a consumer of art nonetheless, and I create many things myself. I found a lot to enjoy about this book, including a few exercises. Even if you don't try any of the creative unblocks the artists suggest, it's cool to read about their processes and draw inspiration there. The contemporary art was interesting, but the interviews were repetitive with most of the artists answering the same questions in similar ways. The suggestions for "creative unblocks" all concern visual art (which makes since considering the artists), but they're not that creative or interesting. There was a lot of time spent on the design of this book and not the editing. In the end, it's an art book; look at the pictures and skip the interviews. I really loved this book - the author interviewed fifty artists of varied craft and mediums about their creative processes, included their original artwork, and then each artist can up with an 'unblocking' project to help the reader work on their own creative process. I found it fascinating and incredibly inspiring. If I had to rate this on originality, I'd give it maybe a two. The author asked mostly the same questions to each artist, making it feel rote, dull after a while. None of the artists really said anything all that different, so it got monotonous.But as an introduction to many new artists, four stars. Was googling and falling down art rabbit holes. I especially liked the variety of artwork featured, for inspiration, as well as each artist's "unblocking" strategy. The interviews got a bit monotonous, with the same questions cycled through 50 artists, so I didn't always read them fully—just skim the bio and enjoy the artwork.Found two typos without really looking, which gives off the impression that this was done in a hurry or something. Most of the art in this book was amazingly ugly! At first I found it off-putting, but the more I read, the more I found it be something that gave real permission to go create. I also came to really appreciate some of the art. I loved the bits about each artist and how they had found their way and what drove them. The exercises were often excellent. Definitely worth the look. [Updated] This is a quick read; the Q&As with each artist were fairly light.... some of the unblocking exercises were brilliant, others not. The book design is lovely, visual eye candy; I'm hoping in the future the author will do a deeper dive as she does in her podcast [which I enjoy]. Overall I enjoyed this book and I have found myself re-reading some of the sections, which is a good sign. This beautifully designed book introduces the reader to 50 artists, many of whom I was unfamiliar. However, the point of the book was not to be biographical but to be inspirational. I feel like she accomplished her goal. Creative blocks happen to all artists and the interviews with many contemporary artists in this book give a real feel as to what an artist's life in creativity feels like . An authentic view of artists. I was inspired by the words of so many artists and by the examples of their work. Wonderful panorama of 50 contemporary artists and their creative process. The creative unblock projects they suggest are fantastic fun. Beautiful book with great interviews and creative prompts. Can't wait to try these out! Fun! Filled with insight, wisdom, joy, encouragement, empowerment, and interesting creative ideas to try. This book has some great exercises for drawing clubs, everything from collage to painting, with interviews with 50 contemporary artists. Lots of inspiration. Not what I expected or wanted. Claimed to sample a wide range of artists but actually pretty limited in scope. The variety of artists work (and stories) provided more inspiration then the actual creative prompts/exercises. It didn't do much for my creative block and I wasn't very inspired by most of the work shown. Back to the sketch book then.